While the Samuel Adams beer portfolio is one of the widest in the market today, they're showing no signs of slowing down. Fresh from the bottling line is the new Samuel Adams Imperial Series, a collection that, according to the company, "represent[s] some of the biggest and most intense beers we have ever brewed." That's saying something with such legendary extreme beers as Utopias and Millennium under their belt. The series is composed of three different beers; two brand new and one old. Over the past 20 years, Samuel Adams Double Bock has become one of the Samuel Adams Brewery's most acclaimed beers. An enormous amount of two-row Harrington Metcalfe and Caramel 60 malts, half a pound per bottle, is used to brew this intense, rich lager. This beer is close to the idea of beer as "liquid bread." Its deep mahogany color, velvet smooth, rich yet slightly citrusy flavor and mouthfeel is a testament to the beer's balance. 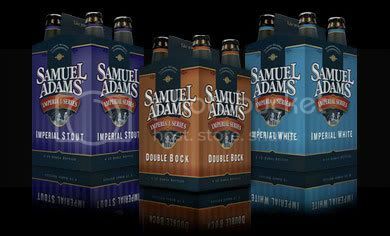 In the past, Samuel Adams Double Bock has been available for a short six-week period. The brewers have decided to make it available year-round with the other Big Beers in the Samuel Adams Imperial Series. Samuel Adams Imperial White pushes out the boundaries of the witbier style. While showcasing the traditional witbier aromas and hazy appearance, it delivers a bigger mouthfeel and body. Brewed with ten spices, and a high quality blend of two-row Harrington, Munich and Metcalfe malts, malted wheat, and an abundance of Hallertau Mittelfrueh Noble hops, Samuel Adams Imperial White is an incredibly robust, refreshing beer with notes of orange and coriander. Much bigger than your average stout, Samuel Adams Imperial Stout is a colossal beer inspired by centuries-old stouts. These traditional stouts were first brewed by 18th century English brewers for the Russian Imperial Court of Catherine the Great. Brewed with an abundance of East Kent Goldings hops and Caramel 60 and Munich malts, this beer is intense with full rich flavors like dark chocolate, coffee and anise. I was surprised to not see their Hallertau Imperial Pilsner (see my review here) on the list. I'm not sure what that means for the fate of Hallertau, as you would think that if they planned on keeping the beer on the market it would be rolled in the new series, like Double Bock. Here's hoping it's not going anywhere, as it's one of my favorites from the boys in Boston. According to the company, you should start seeing these beers showing up towards the end of February, at a price of $9.99 per four-pack.